It doesn’t take too long once you get your hands on an SDR to realise that there’s a lot to learn if you want to move beyond being a consumer of programs and applications others produce. This is where I find myself at the moment, and it is a bit like being back at school but fun. Here’s a few resources I’ve been reading, watching or have bookmarked in no particular order relating to SDR and GNU Radio. As a beginner in this I can’t fully vouch for their quality but they seem okay! http://greatscottgadgets.com/sdr/ Fantastic SDR for HackRF tutorials by Michael Ossmann. https://www.youtube.com/user/2011HPS/videos Some GNU Radio tutorials, no audio though. The next device from the box of bits was a pair of active RFID cards from a top of the range vehicle security system used around 2001-2003. These tags were required to be on your person to start the car in addition to a key. This is just an analysis of the cards RF transmissions and not the system itself as I don’t own one. Popping open the two cards we can see they have similar layouts but the newer board on the right doesn’t look as clean and does not have any PCB labelling. The keys each have a serial number sticker on the back of the PCB as well as having it printed on the front of the card. There are not many components on the card, we can see an SMD EEPROM along with a small SAW device and the PCB antenna. Looking up the SAW device documentation indicated that it will most likely be transmitting in the 433Mhz ISM band on 433.900. The batteries in the cards had long run out, so we just hooked them up to an external power supply and monitored with the HackRF and GQRX, this would have worked fine with the RTL SDR device too. 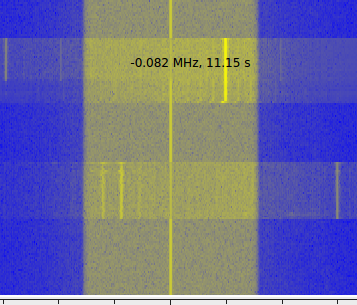 We see a short transmission on 433.920Mhz roughly every 5 seconds but it does vary a bit. The frequency reading is wrong below as the screen shot was captured off an IQ replay. 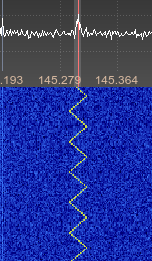 On looking at this a bit closer with baudline it unsurprisingly looks to be an on off keying AM signal. Importing a saved audio clip in to Audacity shows the signal, the first capture looked a bit odd with dips and other strangeness but it turned out I was a bit off frequency, fixing the frequency gave a clearer capture. The first thing I wanted to do was level off the signals to allow for an easier visual comparison, the capture below shows the original signal up top and the altered one below. I used a the same script I used with the previous doorbell project and we can count 78 peaks in each tokens transmission. Comparing transmissions showed that the token is beaconing the same pattern over and over so maybe they are easily repayable as with the doorbell. Interestingly when we look at the two tokens with different serial numbers next to each other we can see a quite long period at the start where they roughly match followed by not too dissimilar patterns after. At this stage I’m guessing the serial numbers are likely just being beaconed following the preamble/synchronisation signal. The signals match prior to the red line. The timings were not particularly consistent even in the initial preamble to allow them to be lined up easily and my previous script to guess binary output based on the period of time (NRZ) was not working perfectly due to this. There appeared to be two spacing times, one around 18 samples and one around 45 samples but these varied by +/- 10 samples which added up to a large error by the end of the 78 state changes. In order to sort this out I added an option to the script we created for the doorbell to make the sample spacing gaps even. So in this instance a sample space of >30 = 40 and <30 = 20 gives us an easy to compare output. Now that the WAV file has evenly spaced samples, we can compare them easier as can be seen in the image above of the two tokens beside each other. The initial preamble matches perfectly between each transmission up to the previously indicated red line and would seem to have 5 8 bit components going by the peak count. Handily enough, the tokens 6 digit serial numbers share one digit in the same place and we can see where these match between the two tokens, we can also see this digit repeated again in two other places in the second serial number, these are indicated in the image above. Now on to the actual decoding! The number of peaks, 78, doesn’t really tally with the indication from the preambles/synchronisation that each part is 8 bits. We now have to turn to a different encoding mechanism commonly used for this sort of cheap OOK device, Manchester encoding. This is better explained somewhere like http://www.quickbuilder.co.uk/qb/articles/, but the idea is that instead of counting the peaks and troughs as a high or low as you might when taking a look at it, we use the transition between high and low values in the middle of a set time period to define the 1 or 0. As we have already altered our file to have a consistent spacing of 20 or 40 samples we can script reading this Manchester encoding easily by starting at the first state change position, measuring forward 39 samples and detecting whether the value increases or decreases in that time period and repeating this process until the end of the file. This gives us the following binary output which looks very promising, we can see the matching patterns for the shared digits in the serial numbers between the tokens. The first 5 preamble bytes are the same, 6 is different, and 7 is the same matching the digit 0 in each of the tokens at position 2 with token 2 having two further digit 0’s all in bold. Now converting each of these from binary to hexadecimal we get a match for ASCII characters so by adding an extra decode step to the script processing the file containing the resized signal, we can see the serial numbers they are broadcasting! 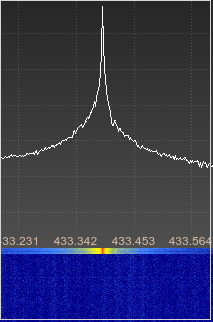 So we have managed to go from a captured signal to decoding a beacon from an active RFID card in not too many steps. I’m not going to go in to any more details but it doesn’t seem a particularly secure security device on the evidence we have gathered here. Now this would be a lot nicer if I could do it with GNU Radio as it is happening, but small steps! The signal appeared to comprise of fast on off bursts, On Off Keying. As suggested by other peoples attempts at things like this, I used baudline for the first time to have a closer look at the bursts and we can see things a bit more clearly. This didn’t help too much beyond giving me a count of the number of bursts per button press, they looked similar enough to the eye too. I’m not sure if there would have been a better way to look at this in baudline but will have a look at it again another time. 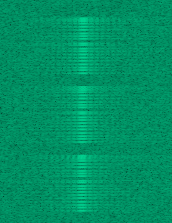 I recorded the AM signal audio in GQRX to a WAV file, the bursts were quite clear to the ear. On opening this up in audacity we can see groups of pulses making up a single button press. On zooming in to a button press, we can see these button presses are made up of similar looking groups. And closer again we can see the signals are well defined with the first four peaks equidistant which suggests a preamble/sync. Each of the groups within a button press have the same waveform. Now I tried measuring them but there was no easy way to do this by sight or on paper so I wrote a small python script to take the wav file and alter one channel to be either +1 if > 0 or -1 if < 0 to be more clear. I’ve since changed this to be 0.9 and -0.9 as it’s more readable. Now the counting was still awkward so I added a sample count to the script to give the distance between each pulse which enabled me to pull off a stream treating it like binary known as non-return-to-zero. This didn’t however give anything that insightful, but I don’t think there’s going to be much point in going any further with this on a doorbell. The next step will be to try and record and replay the request using hackrf_transfer. There are a few basic software packages or SDR that can be exceptionally handy and they don’t require much work to install, here’s a couple from gr-osmocom that are likely installed already if you are up and running already. 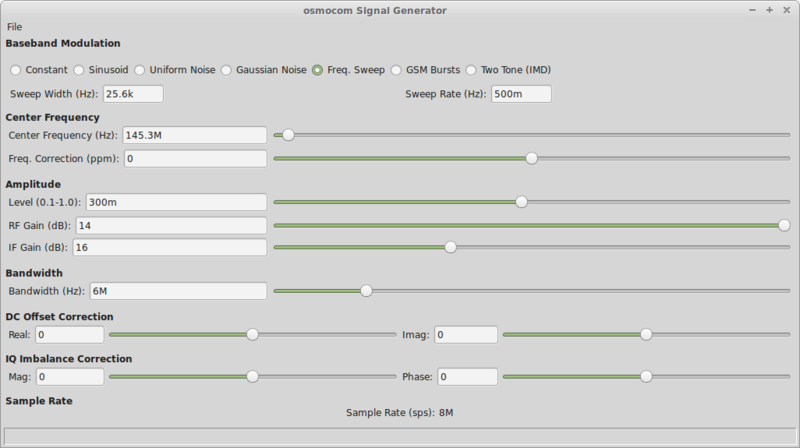 Another handy one that should also be available already is a signal generator, osmocom_siggen, that will allow you to generate some basic signals. Take care to make sure you are transmitting on a frequency you are allowed to, the application starts transmitting straight away so set the frequency on the command line. If you don’t exit it properly it will stick on transmit. 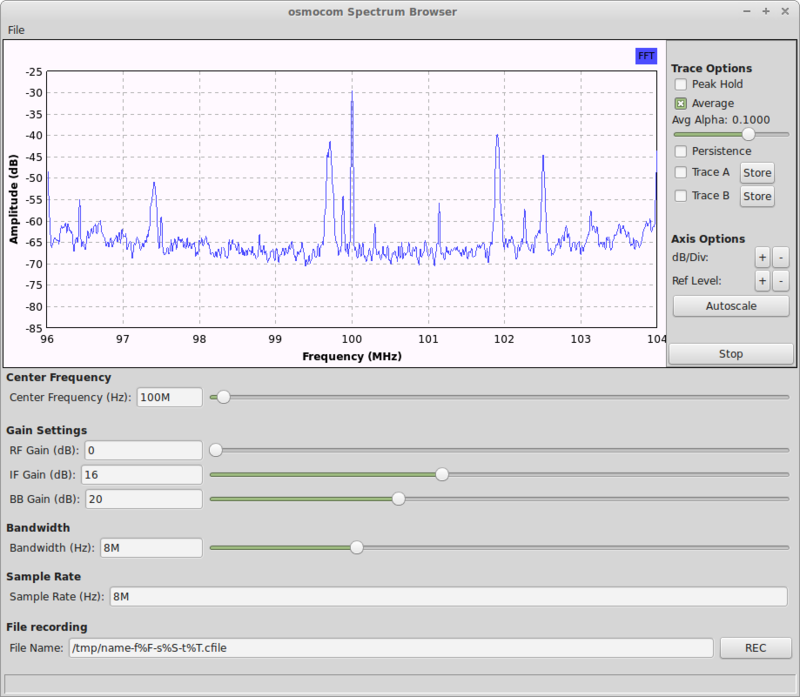 Another handy application is osmocom_spectrum_sense. This will give power readings for a frequency or within a range in the console so could be handy for quickly scanning or checking for a strong signal. It can be run over a range or on a single frequency with a 0 range. In the single example below we first get a reading of 15 from a broadcast fm station, the second reading of 2.7 is from 1mhz under the broadcast station where there is just noise.